Over 1,000 artists, including 60 around Banbury alone, are exhibiting their work across Oxfordshire for the county’s Artweeks. Running until May 30, Oxfordshire Artweeks will see more than 450 exhibitions take place in the county and is one of the longest running and biggest open studio events in the UK. Exhibitors include painters, designers, potters, sculptors, photographers, jewellers and textile artists who are opening their homes, studios and other venues for free to allow the public to take a look at what they do. The artists include 150 who are taking part in Oxfordshire Artweeks for the first time. In Banbury town centre, newcomers to Artweeks for 2016 include Tracy Jane who creates contemporary handmade jewellery and found love through her art. She met her husband, Gilbert Csecs, at the Chipping Norton Craft Fair in 2013, and they struck up a friendship. They were married last August. The couple will be exhibiting together at their home on Broughton Road. Also exhibiting in Banbury for the first time is Ella Hendy, who captures the character of soft toys on canvas and, as part of a series of mixed-media pictures with a wallpaper theme, is creating an interactive painting in Naomi’s Café Bar on Bridge Street. Her work is on display from May 21 to 30. The Mill is having a varied exhibition on the theme of In a Land Faraway, which runs on May 9 to 14, 16 to 21, 23 to 28 and 30. Gavin Preuss, from Balscote, grew up in South African where he was an anti-apartheid activist, presiding officer at a polling station for the first democratic elections, later becoming global conflict advisor to Oxfam. His photographs, which are on display at St Nicholas Church, in Chadlington, from May 21 to 30, celebrate the beauty and peace of the Cotswolds. Venture further afield and in Sibford Ferris, the Temple Mill is opening its doors and at the National Herb Centre at Warmington three artists will host a large exhibition of varied styles. Pig Pen Pottery in Bloxham, will be showing some of its stoneware pots of ‘Pleasure and Purpose’, from May 21 to 30 while hand-carved spoons by master woodworker, Martin Damen, in Great Bourton, will be on show at Honeysuckle Cottage. Visitors are invited into hundreds of spaces, many of which are usually closed to the public. There will also be art trails through Oxford streets, Cotswold villages, along the Thames or through the county’s market towns. The full exhibition listings are available at www.artweeks.org. > An artist who has just returned from sketching in India will be exhibiting her work at her local pub. Jenny Eadon’s work, which includes drawings and watercolours from her visit, will be on display at The Bell in Great Bourton. There will also be oil paintings from her previous trips there. This time all the travels were in Kerala, and among the sites were a Hindu festival with huge elephants standing motionless in a line amid the noise of drums, horns and fireworks, dipping Chinese fishing nets in Cochin, and fishermen landing and then auctioning great baskets of fish on the beach. She will also be showing her larger abstract oil paintings based on a visit to Rajasthan but painted back in the studio, showing the impressions and memories gained there. Her work is on display on May 21, 22, 28 to 30. > Jan Wilkinson, of Great Rollright has been dawing and painting horses, family pets and wildlife for over 30 years. She says working with horses in studs, show and hunt yards has given her a ‘hands on’ appreciation and understanding of these animals. She said: “Stubbs, Munnings and Lucy Kemp Welch have been my inspiration, though painting with pastels gives me my own way of working. Among the animals she has painted are the Queen Mother’s favourite brood mare at the Royal Stud at Sandringham. Visit the exhibition between noon and 6pm. 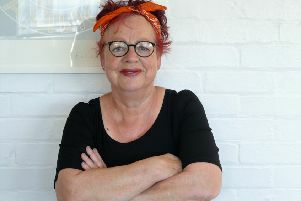 > Potter Penny Varley, who has her own studio in Tysoe, threw her first pot as part of an O-level course in 1980, and had aspirations of being a famous potter. Needing some money to get started, she applied for a job in Oxford and learned skills in business, management, teaching and working with the public. After 25 years of office work and attending a pottery evening class in Banbury for four years, she decided to take the plunge and become a self-employed artist. She has focused on garden ceramics, many of which are frost proof and are themed around the countryside and plants. Her indoor work includes mugs, jugs, bowls, oil pots and practical items for the kitchen. She regularly exhibits as part of Oxfordshire Art Weeks and Warwickshire Open Studios, and has shown work at Compton Verney and the Ashmolean Museum in Oxford. She said: “I feel it is important to bring the art to the people. “As part of my enthusiasm to spread the ‘pottery word’ I run one-to-one workshops for adults whether complete beginners or returners to clay and am a regular speaker at WIs, Probus and art groups. “Being a bit of a foody last year I completed bespoke commissions for eateries in Leamington, London, Cork and Banbury, and in 2010 completed a commission for a Cambridge based technology company where my work was unveiled by HRH the Prince of York. See Penny’s work at 109 Fairacres Road, in Oxford, from noon to 6pm, on May 7, 8 and 12 to 15. > Sarah Smith will be exhibiting her work of prints and paintings at The Old Coach House, in Church Lane, in Milcombe, from May 21 to 29, from 11am to 5pm. Among her work is a screenprint of the inside of The Dovecote roof, in Milcombe. It was originally part of the Milcombe Hall estate and was constructed in the early 18th Century. The work shows its complex roofing structure and is printed in different colours.